I was inspired by an instagram photo of @janablanco of these bacon pancakes so today I made some using my cheat/treat-day Oscar Meyer bacon They cost an arm and a leg in Jakarta, but definitely worth it for an occasional weekend treat, because the local bacon tastes funny to me. See how simple it is to make after the jump! I make my own pancake mix using ingredients in the cupboard and this pancake recipe. Place strips of bacon on top of about 4 sheets of paper towels, then top with more 4 more sheets of paper towels. (Like a bacon paper towel sandwich!) Pat to make sure that bacon inside is nice and snug. The bacon will shrink and the fat will cook off. When it’s completely done the fat will still feel soft, but after a few minutes it will end up dry and crispy too. Once your bacon is done, fire up your pan and brush on some butter. 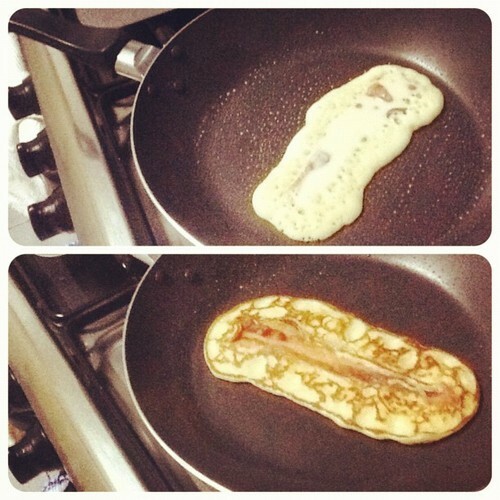 Plop your bacon on the pan, and squirt pancake mix on top of it. Once the bottom is set and golden, flip on to the other side. Flip on to your plate once done and repeat. Serve with pure maple syrup on top! YUMMmmmm! Oscar Meyer bacon is very hard to find. There was only one left in Ranch Market so I grabbed it. I 8oz pack is IDR 92,000 (about USD 10 or Php 500). Crazy right?! ?